Kieran Savage with Sharon O’Donoghue of Volac. The installation of the Volac Urban Alma Pro feeder has meant a big reduction in labour and led to seamless weanling of calves. Kieran checking calf drinking behaviour on the computer screen. 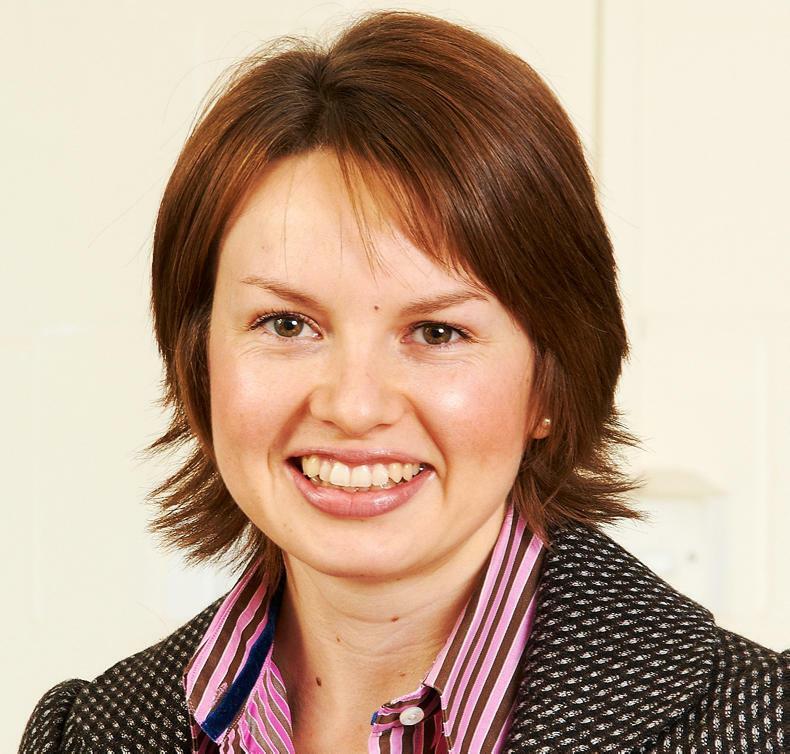 Dr Jessica Cooke; calves should be fed up to 900g/day of a high quality milk replacer in order to gain 0.7-0.8kg/day from birth to weaning. 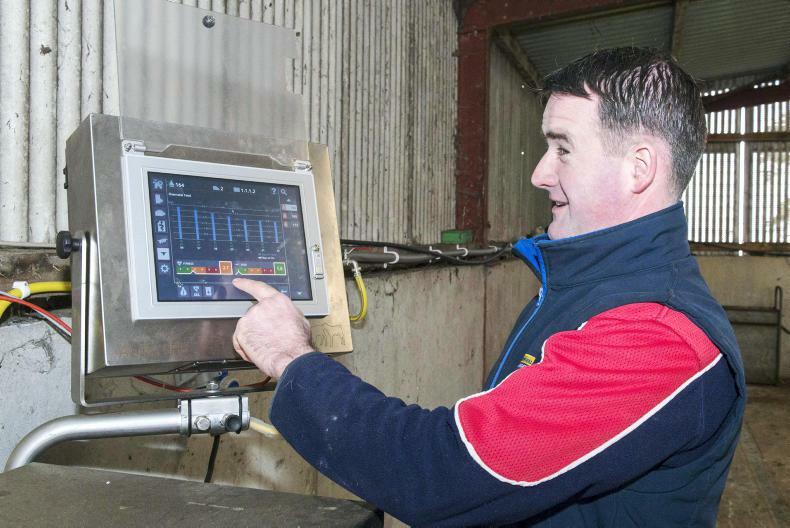 The feeder represents the very latest in computerised calf feeding technology, incorporating new features such as automatic teat cleaning with disinfectant and the latest touch screen technology which gives users a simple overview of calf health and welfare. Kieran and his wife Anne have a herd of 180 pedigree Holstein Friesians at Tylough, Kielduff, Tralee. The couple have four children, Cora, Micheál, Conal and Alice, ranging in age from 16 back to eight. The herd is one-third autumn and two-thirds spring-calving with the milk being supplied to Lee Strand co-op. They have one fulltime employee, Jacek Kaczmarczyk while Mossie Harrington provides relief work. Kieran’s father Michael also helps out. The Urban Alma Pro was installed just before Christmas 2017. It can feed up to 120 calves at four feed stations. Kieran is using two feed stations which enables up to 60 calves to be reared at one time. All bull calves are fed whole milk and sold at two to three weeks old. All heifer calves are fed on the feeder. They are kept in individual hutches and fed whole milk for the first 10 days and then moved on to the feeder. They are fed Volac Heiferlac, the milk replacer tailor-made for high performing replacement heifers. The calves are programmed to consume six litres/day of Heiferlac, mixed at 150g/litre. They are weaned after 60 days on the feeder. Kieran Savage aims to double birth weight at weaning which means a daily growth rate of around 0.8kg while calves are on the computerised feeder. Heiferlac is designed to deliver a growth rate of 0.9kg/day when mixed at 150g/litre and fed in conjunction with ad lib concentrates, quality roughage and fresh water. “So far, so good” is how Kieran describes his experience to date with the computerised feeder. “It has meant a big reduction in labour. We have no problems with scours and no digestive upsets when calves are mover on to the feeder. Also the weaning of calves has become a very seamless event. 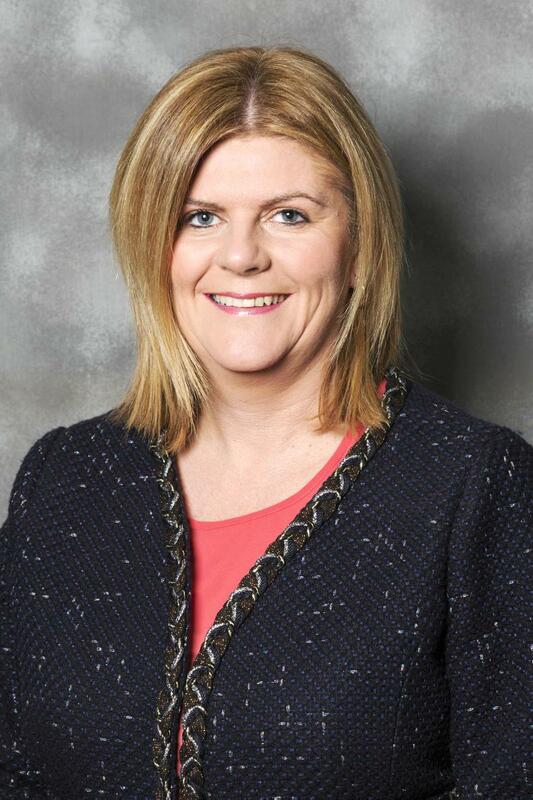 “While rearing calves on a computerised feeder makes milk feeding easier and more time-efficient, it is not a short cut to better management,” said Una Hickey, national sales manager with Volac. Una, who has wide technical and practical experience in advising farmers on the use of computerised feeders, stressed the importance of strict hygiene and making sure that ventilation and drainage in the calf house are fit for purpose. “When farmers install one of Volac’s Urban or Forster Technik machines, our advice is to spend the time they save on manual feeding in observing the health of the calves. “Aside from the reduction in drudgery in feeding, the big advantages of computerised feeding are the consistency in the concentration and temperature of the milk replacer and the ability of calves to drink their allocated allowance in small portions, simulating the natural feeding behaviour of a calf sucking a cow. She recommends putting calves on the computerised feeder when they are seven days old. They should be fed six litres/day. The machine can be programmed to enable the calf to consume its daily allocation ‘little and often’. Table 1 shows recommended feeding volumes for calves weaned at 56 days. Some farmers operate longer feeding programmes, up to weaning at 84 days, in order to maximise weight at weaning and higher lifetime performance. Una Hickey recommends feeding six litres/day at a concentration of 15% up to day 35. The volume should be reduced to five litres/day for the next two weeks and to 2.5 litres/day for the week prior to weaning. Dr Jessica Cooke, technical manager with Volac, recommends that calves should be fed up to 900g/day of a high quality milk replacer, such as the Volac Lifeguard range, in order to gain 0.7-0.8kg/day from birth to weaning. This is especially important for replacement heifer calves that are targeted to calve at 24 months. She cited research from the Royal Veterinary College in London which showed a weight gain range from as low as 400g/day to 900g/day on a sample of British farms. “It showed that increasing the amount of milk replacer per calf from 20kg to 46kg was associated with an increase in average daily gain of 0.11kg up to 63 days. In addition, calves fed the higher level were 13kg heavier and 3cm taller at 229 days,” she said. Weigh scales, which record a weight every time a calf feeds, are an optional extra with Volac computerised feeders and can add greatly to ease and efficiency of management. Volac’s range of six milk replacers are marketed under the Lifeguard milk formula banner. Triple A Golden Maverick, Golden Maverick Hi-Spec, Blossom Easy Mix, Blossom Hi-Spec, Heiferlac and Olympian all contain high levels of imunopro, the highly nutritious bioactive complex produced from liquid whey. They also contain added health packages - Gardion (derived from garlic) and Nutry-Lyst, which enhance the immune system and improve gut health. Butyrate, an important fatty acid, is also added as are vitamins and minerals. Butyrate improves nutrient absorption and helps in rumen development. 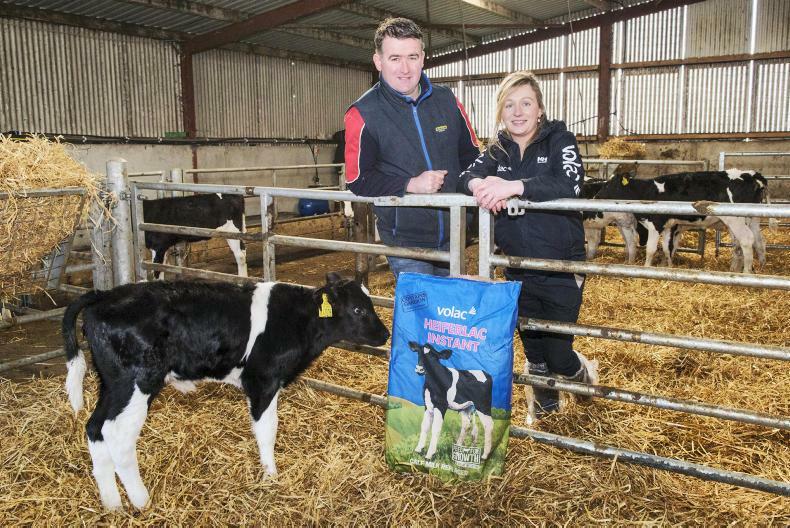 All this ensures that when farmers use a Volac milk replacer they can be assured they are using the highest quality product on the market, which will deliver top calf performance.